Within the next two years, Ukraine plans to completely do without Russian gas in order to strengthen its energy independence, President Petro Poroshenko said Monday at the University of Zurich. “Ukraine used to import almost 70 billion cubic meters of gas, and now almost 40 (billion cubic meters). 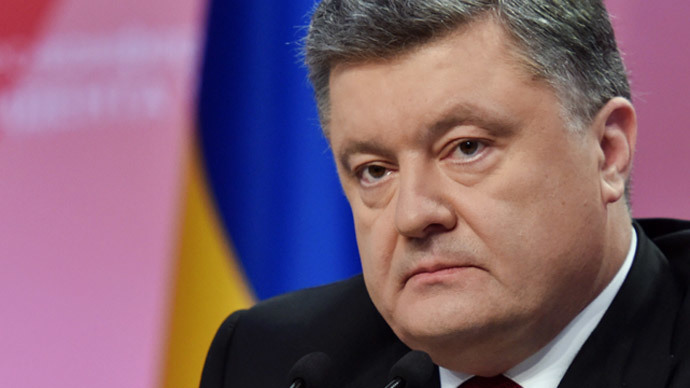 [But] in two years, we will not need Russian gas at all," Poroshenko said, as quoted by the Unian news agency. The President is in Switzerland to attend this week’s Davos World Economic Forum. The country started to receive Russian gas in December after a six-month hiatus. In June, Gazprom switched Kiev to a prepayment system after arrears exceeded $5 billion. As a result, Russian gas exports to Ukraine dropped by 50 percent in 2014. The Ukrainian debt currently stands at $2.44 billion, after paying off two large tranches in November and December. Kiev can buy gas from Russia at $378 per 1,000 cubic meters, a lower price than Russia offers most of its European clients. This deal is valid through the end of March, and then the discount is over. With an ongoing civil war and government reforms, Ukraine has been experiencing a major energy crisis, causing electricity blackouts and disruption in hot water. Ukraine is believed to be home to the third largest shale gas reserves in Europe, but has not been able to develop the industry. US and European officials have been trying to find ways to help Ukraine limit its dependence, including the possibility of the US approving the export liquefied natural gas.